You thought you could take him from me, but you lost. Now, that he’s mine I’ll do anything to keep him. Do you doubt me? I have everything that was supposed to be yours. In case you were wondering; he doesn’t ever think about you anymore. I won’t let him go….ever. Tarryn Fisher has done it again, she wrote another brilliant book and I will be a fan for life! If you are expecting another The Opportunist you won’t get that with Dirty Red BUT it’s equally as good, I promise you that!!! There is less angst but still plenty of cringe-worthy and high blood pressure induced moments. There were moments where I found myself cracking-up because some of the scenes were hilarious. It’s the kind of funny where you laugh and then think, oh no she di’ent!! My emotional pendulum was swinging all over the place while I read this book!! While I hated Leah in the Opportunist, she did things in this book that were absolutely detestable and I would classify her as a master manipulator. Now, with that being said, I didn’t hate her. (please, no need for any eye-rollin’) Tarryn gives a glimpse here and there as to why she does the things she does and I actually found Leah to be quite heartbreaking. I wouldn’t say she had redeeming qualities but there was something about her that didn’t make me continue to hate her, if anything I found myself feeling her pain and finally understanding her motives. Simply put, she craves to be loved and that desire is so strong…she doesn’t care who she hurts. 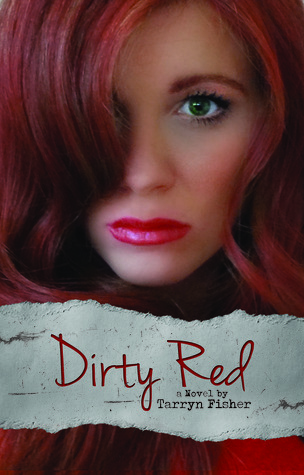 Dirty Red is filled with insecurity and sadness, an exhausting emotional journey that I endured at the hands of Tarryn Fisher and I loved every page of this book!!! I understood Caleb so much better in this book because I understood his decisions and I love him more now than I did in The Opportunist. I’m so team Caleb and Olivia, that if they don’t get their “happily ever after” I will have to stalk Tarryn Fisher and ask…WHYYYYYYEEEEEEE???? That seems a bit intense but this book inspires that kind of reaction and I’m not afraid to say it!! So many questions are answered in this book but those answers lead me to more questions and the ending just about pushed me over the edge, it left me wanting more!! My final two cents: I love this book!!!! This is a must read and it will not leave you disappointed!